Your son rode his bike without his knee pads again, and this time he fell and got road rash. Your daughter picked up a hot pan before realizing it just came out of the oven. You stay out in the sun too long because you want to up your Vitamin D levels and didn't notice you got a sunburn. All situations where our skin is begging for a soothing remedy now. Make up this Burn Soother recipe today so it will be ready to go when you need it. Store in your refrigerator if you can – the cooler temperature will help this remedy feel even more soothing. Using aloe vera gel and refrigerating the jojoba will make for a thick enough consistency to stay on the skin and not easily drip off. 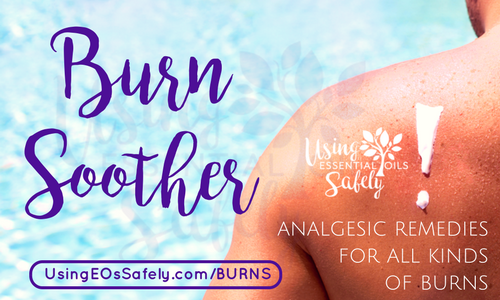 Smothering the burn is exactly what is needed so those analgesic essential oils can do their job! This is a 5% dilution according to my dilution chart over on Diluting Essential Oils Safely. Add the aloe and jojoba to a 2 ounce squeeze bottle with lotion cap. Shake or stir with a glass stirring rod to mix. Add the essential oils, and shake or stir again. Refrigerate to better soothe when applied. Another option: Make a Burn Spray! 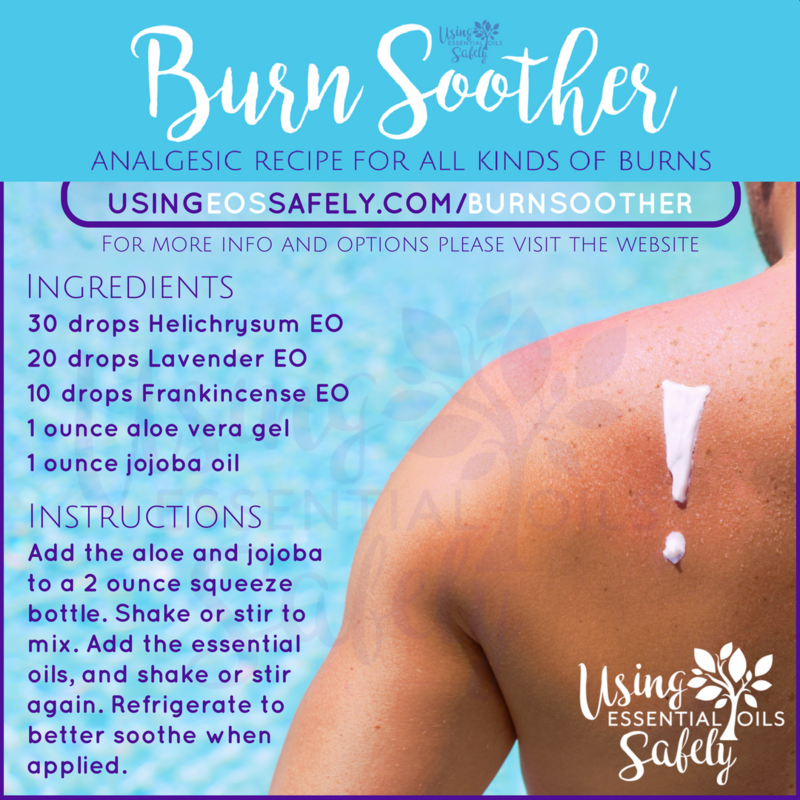 Replace the aloe vera gel with aloe vera juice and jojoba oil with hydrosols (Helichrysum, Lavender, Frankincense, and/or Calendula) and add to a spray bottle. Shakeshakeshake before using to be sure the essential oils are evenly distributed when you spritz. You can use hydrosols alone if you wish, and for some types of non-serious burns they may be all you need. Q: I don't have Helichrysum. Can I leave it out and just add more Lavender and Frankincense? A: Helichrysum is the backbone of this recipe. You can replace it if you want, but I would prefer you wait until you have some. Q: I don't like Lavender. Can I use something else, or leave it out? A: You can replace with more Helichrysum or Frankincense, or you can substitute the Lavender for Copaiba, also analgesic (and without the floral aroma). Q: Do I have to use aloe vera at all? Can I just use a carrier oil? A: Aloe vera has skin-healing and soothing properties which makes it a great addition to this recipe! You can make it without (just replace with a carrier oil), but it won't be quite as effective. Please try and get some – it's soooooo worth it! 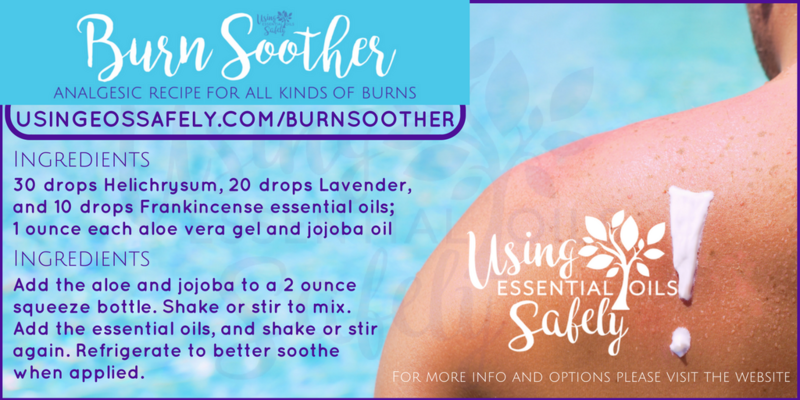 Q: I read somewhere it might not be a good idea to apply oil to a burn, but you have jojoba oil as part of your recipe. Feedback, please? A: You may find some thoughts out there about oil potentially increasing the heat in a fresh burn. I do suggest you refrigerate your Burn Soother, and this won't be an issue. If you have any concerns, make the Burn Spray. Q: Can I replace the jojoba oil with another carrier oil? A: You sure can! Just note, that most other carrier oils won't harden when refrigerated, so the consistency will be a bit thinner (which some might prefer). A: Yes! For more information on essential oil safety with children read: Essential Oils and Children. Q: You recommend a plastic bottle. Shouldn’t I use glass so the essential oils don’t eat away the plastic? A: Pure essential oils should be stored in glass, but when essential oils are diluted in a recipe like this, you can use plastic (PET plastic is ideal). A: I personally use several different brands of essential oils with great results (you can find my opinion here. You can use whatever brand you have on hand, as long as the Latin names match ?